Part 4 contains supplementary provisions (regarding the power of the court to make rulings, etc.). The Act2 was recently amended in 2016 with an aim to make it more robust by plugging the lacunae that existed in the original legislation. Part 1 of the Act applies to all arbitrations. However, a distinction is drawn in the case of arbitration with its seat in India and international commercial arbitration with its seat located outside India. In the former case, the provisions of Part 1 (barring the derogable ones) are compulsorily applicable. In the latter case, parties to the arbitration may by express or implied agreement agree to exclude all or any of the provisions of Part 1 of the Act,3 and in such case the laws or rules selected by the parties would prevail. An arbitration is considered to be an international commercial arbitration when it involves a dispute that is commercial in nature and involves a party who is either a foreign national or a person who habitually resides outside India, a company incorporated outside India, a company, body or association of individuals that is centrally managed and controlled outside India, or a foreign government.4 All other arbitration, by implication, is considered to be domestic arbitration. Parties have the freedom to refer both current and possible future disputes arising out of legal or contractual relationships to arbitration. The substance of certain disputes, however, is recognised to be non-arbitral in nature, and is in the exclusive domain of specific tribunals and courts as a matter of public policy (e.g., landlord–tenant disputes, criminal proceedings, matrimonial matters, insolvency matters and competition disputes). One of the primary objectives of the Act was to reduce judicial intervention in arbitration. This was given effect to by the recognition of the principles of the separability doctrine6 and the doctrine of Kompetenz-Kompetenz.7 Further, there is a specific bar on judicial authorities from interfering in arbitration proceedings unless specifically permitted.8 The Act also makes it mandatory for a court to refer matters to arbitration on an application by a party to any action before it that is the subject of an arbitration agreement (provided this application is made before the party has made its first submission on the substance of the dispute). The court system in India is a complex single integrated hierarchical system based on territorial, pecuniary and special jurisdiction. there are many subordinate courts to the court of the district and sessions judge in a three-tier system – the civil judge (junior) division is the lowest court on the civil side. In the case of domestic commercial arbitrations, a petition for judicial intervention or assistance must be made to a civil court of original jurisdiction, which would have jurisdiction to decide the questions forming the subject matter of the arbitration if the same had been the subject matter of a suit under the Civil Procedure Code 1908. This court must also not be inferior to a principal civil court. In the case of international commercial arbitrations, the legislature has brought about a much-needed amendment wherein the jurisdiction of district courts has been curtailed. A petition for judicial intervention in such cases has to be made before either the state high court that has original jurisdiction15 if the subject matter of the award had been the subject matter of an ordinary civil suit or, in states where original jurisdiction is before a lower court, the petition is to be made to the high court which would have had jurisdiction to hear appeals from decrees of courts subordinate to that high court. Parties are free to determine the number of arbitrators as long as the number is not even. If parties fail to agree to an odd number, the tribunal would then comprise a sole arbitrator. Parties have the freedom to determine the nationality and qualifications of the arbitrators as well as set a procedure for appointing them. If a party or the arbitrators fail to nominate an arbitrator or chair of the tribunal as the case may be, a petition may be made to the chief justice to appoint an arbitrator. For an international commercial arbitration, the Supreme Court must be petitioned. In the case of a domestic arbitration, the petition would lie before the high court within whose local limits the principal civil court is located. A party may challenge the appointment of an arbitrator if there are doubts or circumstances that have not been disclosed and waived by the parties, or if the arbitrator does not possess the qualifications agreed to by the parties. Such challenge must be made in writing to the tribunal within a period of 15 days of either the appointment or the receipt of knowledge of such circumstances.19 If a challenge to an appointment is unsuccessful, the arbitration must proceed, and the party challenging the appointment has the option to make an application to set aside the final award under Section 34. Parties are given full autonomy to agree to the rules of procedure, the extent of pleadings to be adopted, the necessity of oral hearings, and the seat and language of the arbitration. Failing such agreement, the tribunal has the authority to determine these issues. The arbitral tribunal is not bound by either the Civil Procedure Code 1908 or the Indian Evidence Act 1872. However, the Civil Procedure Code 1908 applies to court proceedings that arise in relation to arbitration. The Indian Limitation Act 1963 applies to arbitrations as it applies to court proceedings. For the purposes of limitation, an arbitration is deemed to commence on the date referred to in Section 21, which specifies that (unless agreed otherwise) arbitration is deemed to have commenced on the date a party sends a request for arbitration. This period may be extended with the consent of the parties for a maximum period of six months. Any further extension can only be done by way of an application to the court. The court in such instance may extend the period for sufficient cause. It also has the power to order a reduction of the arbitrator's fees by a sum not exceeding 5 per cent; substituting one or all the arbitrators, with the arbitration continuing on the basis of the evidence and material already on record; and imposing actual or even exemplary costs on a party. The tribunal is empowered to appoint its own expert to report directly to it on specific issues; parties are bound to fully cooperate in respect of relevant information and documents in this regard.22 Unless agreed otherwise, parties have the right to examine the report of the tribunal's expert and also examine such expert at the oral hearings, as well as presenting their own experts. An appeal would lie from orders of the court that grant or refuse to grant relief for interim measures and that refuse to set aside an arbitral award. Similarly, an appeal will lie from orders of the arbitral tribunal that grant or refuse to grant interim measures, and from findings in favour of parties who have challenged the tribunal's jurisdiction or authority. the award is against the public policy of India. The judgment of the Supreme Court of India in ONGC v. Saw Pipes Ltd29 had attracted a great deal of criticism from the international arbitration community. The Supreme Court examined the scope and ambit of the jurisdiction of the court under Section 34 of the Act. The Court first held that an award is patently illegal if it is contrary to the substantive laws of India. It then went on to expand the meaning of the phrase 'public policy of India', citing that the phrase needed to be given a wider meaning, and that the concept of public policy connotes some matter that concerns the public good and the public interest. It further held that an award that is patently in violation of statutory provisions could not be said to be in public interest. Furthermore, the Court held that an award could be set aside if it were contrary to the fundamental policy of Indian law, contrary to the interests of India or contrary to justice or morality, or patently illegal. This holding of the Supreme Court has been severely criticised as it has opened the floodgates, giving parties a wider scope of challenging arbitral awards. The recent amendment to the Act has sought to narrow down the wide import of the term 'public policy' and manner in which matters were virtually being heard de novo on the merits to examine if they violated the fundamental policy of Indian law. By way of introduction, Explanation No. 1 to Section 34 clarifies that an award is said to be in conflict with the public policy of India only if the making of the award was induced or affected by fraud or corruption, or was in violation of Section 75 or 81; it contravened the fundamental policy of Indian law; or it is in conflict with the most basic notions and morality of justice. The Legislature has also clarified by way of the introduction of Explanation No. 2 to Section 34 that the test as to whether there is a contravention of the fundamental policy of Indian law shall not entail a review on the merits of the dispute. A peculiarity of the Act prior to the recent amendment was that once an award was challenged under Section 34, the award remained unenforceable under Part 1 of the Act pending the outcome of the challenge. The recent amendment to the Act has sought to address this issue. A party seeking to challenge and set aside an award is now bound to obtain a stay on the execution of the award from the court, failing which the award holder may seek execution of the award. This is a welcome change, and would enable courts to impose terms on parties requiring them to put up security towards the monies awarded under the award, similar to when a party appeals from a money decree. India is a signatory to both the New York Convention 1958 and the Geneva Convention 1927, and Part 2 of the Act is the legislation adopted by India to implement its commitments under these Conventions. India's accession to the New York Convention was dependent on it recognising only those awards that were made in Convention countries, which the central government of India has declared to be a reciprocating territory in the Official Gazette. Thus, an award does not enjoy the benefit of Part 2 of the Act if it is passed in a Convention country that is not a reciprocating country. Scenarios in which challenges to the enforcement of an award may be entertained under Part 231 correspond to Article V of the New York Convention. Section 48(2), however, provides two additional reasons to refuse enforcement, namely when the subject matter of the dispute is not capable of settlement by arbitration in India, and where the enforcement of the award results in the contravention of India's public policy. If an award is recognised as per the prescribed procedure in Part 2, it may be enforced as a decree of the court under the Civil Procedure Code 1908. Prior to the recent amendment, any application for recognition and enforcement of an award would have to be made to the court that had jurisdiction over the territory where the assets of the award holder was located. This meant that in many cases such applications were filed in remote district courts, and some times before judges who were not familiar with the New York Convention. This naturally slowed down the recognition and enforcement procedure. Arbitration practice followed in India is largely ad hoc. The Act recognises institutional arbitration, and permits parties to allow an institution to administer the arbitration. There has been a shift recently in the outlook of parties and the legal community, who have slowly started accepting the many added benefits of arbitration being administered by an institution. The most popular local arbitration institution is the Indian Council of Arbitration (ICA), which was established in 1965. It is the largest arbitral organisation at the national level. The ICA is allied to both the Federation of Indian Chambers of Commerce and the Industry and the International Centre for Alternative Dispute Resolution. In an effort to provide arbitration services under the rules of foreign arbitral organisations, the ICA has entered into international mutual cooperation agreements with important foreign arbitral institutions in more than 40 countries. Notwithstanding this, during the ICA's existence over the past 45 years, a significant majority of arbitrations have been ad hoc. 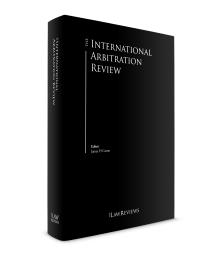 In recent years, however, the trend has been to provide for arbitrations administered by international arbitration institutions such as the ICC, the London Court of International Arbitration (LCIA), the Singapore International Arbitration Centre (SIAC) and the American Arbitration Association. While some positive steps have been taken towards the growth of institutional arbitration in India with the ICC appointing its first regional director for south Asia, there have also been some hiccups, with a reversal of what was perceived to be one of the biggest steps for institutional arbitration in India. Recently, the LCIA announced that it was shutting down its subsidiary, LCIA India, which was established in India in 2009, citing on its website 'that Indian parties were equally content to continue using the LCIA Rules and there are insufficient adopters of LCIA India clauses to justify a continuation of the LCIA India Rules'. Existing arbitrations and new referrals based on existing contracts (as at 1 June 2016) would be administered from London under the LCIA India rules. 2016 saw the implementation of some much-required amendments to the Act, which were brought by way of the Indian Arbitration and Conciliation (Amendment) Act 2015. This is a step in the right direction by both the government, which is taking steps to introduce investment in the country and provide a robust dispute resolution mechanism for investors who come to do business in India, and the Indian judiciary, which has over recent years minimised its interference in the arbitral process. Of the key amendments highlighted above, the most notable change has been that regarding the definition of 'Court' in Part 1 of the Act. Indian courts cannot order interim relief in support of foreign-seated arbitrations. The Court, in its judgment overruling Bhatia International, had recognised that there was a need to provide a mechanism whereby a party would get effective interim relief for a foreign-seated arbitration. It had, however, recognised that neither the scheme of the Act nor the Code of Civil Procedure, 1908 provided for a mechanism wherein such interim relief could be obtained. Taking a cue from this judgment and recognising the shortcoming in the legislation, the definition of 'Court' in Part 1 of the Act has now been amended, widening the jurisdiction of the high courts in India to aid foreign-seated arbitrations. Pursuant to this amendment and subject to the contrary, a party may now approach an Indian high court to seek relief for interim measures under Section 9 of the Act or seek the assistance of the Indian high court to enable the taking of evidence as envisaged under Section 27. In short, the legislature has recognised that such orders needed the force of enforceability of a court order against a party who has no business interests outside India, which may not have been available if the same had been obtained from a foreign court or a foreign-seated arbitration. While the amendments are a step in the right direction and well-intended, they are not without issues. The most immediate of these is a practical one, wherein finding an established 'heavyweight' arbitrator to accept high-stake complex arbitrations in three-member tribunals has become increasingly challenging, as these individuals recognise that they may not be able to achieve the highly aggressive timelines stipulated in the amended Act given how busy their diaries are, unless they are either the sole arbitrator or the chair of the tribunal. The timeline of one year starting from date of receipt of notice of appointment of arbitrator has posed considerable difficulty for both the arbitrators and the parties to conclude the arbitration in stipulated time. This issue is being now considered by the Union Cabinet in the recent Arbitration and Conciliation (Amendment) Bill, 2018 to be introduced in the parliament. Subsection (1) of Section 29A is proposed to be amended by excluding international arbitration from the bounds of the timeline and further to provide that the time limit for arbitral awards in other arbitrations shall be within 12 months from the completion of the pleadings of the parties. The exclusion of time until completion of pleadings is expected to help the parties and the arbitrators to stick to the timelines and moreover will prevent the courts from being overburdened with extension applications under Section 29A(5). The new bill also provides for appointment of arbitrators through designated arbitral institutions by the Supreme Court and the High Courts. It is envisaged that the parties may directly approach arbitral institutions designated by the Supreme Court for International Commercial arbitration and in other cases the concerned High Courts. This is a welcome move as in most cases Section 11 is just an administrative exercise for which the courts that are already burdened with a heavy backlog of litigations need not be further troubled. This would also help to expedite the constitution of the arbitral tribunal. Notably, a new Section 87 is proposed to be inserted to clarify that unless parties agree otherwise the Amendment Act 2015 shall not apply to (1) arbitral proceedings that have started before the commencement of the Amendment Act of 2015, and (2) court proceedings arising out of or in relation to such arbitral proceedings, irrespective of whether such court proceedings are started prior to or after the commencement of the Amendment Act of 2015 and shall apply only to arbitral proceedings commenced on or after the commencement of the Amendment Act of 2015 and to court proceedings arising out of or in relation to such arbitral proceedings. The Supreme Court had earlier heard arguments in this respect in Arup Deb Andors and Ors. v. Global Asia Venture Company34 and reserved its judgment. The courts have been very active in recent years in interpreting key aspects of the Act and local arbitration institutional rules, as well as arbitration clauses. In A Ayyaswamy v. A Paravisam,38 the Supreme Court of India recognised that the arbitrability of a dispute is to be decided by the court in its review under Section 8 of the Act. The Court also held that 'fraud' falls within one of the exceptions to arbitrable disputes due to it falling within the exclusive domain of public fora. However, the Court warned against allegations of fraud made merely with the purpose of avoiding the process of arbitration. The Court held that for the dispute to be non-arbtirable, these allegations should be such that not only are these allegations so serious that, in the normal course they may even constitute a criminal offence; they must also be complex in nature and demand extensive evidence. In line with the recent trend of a pro-arbitration approach, the courts have upheld the validity of arbitration agreements and interpreted vague arbitration agreements in a manner that is pro-arbitration and workable bearing in mind that parties always intended to take their disputes to arbitration. The Supreme Court of India in Centrotrade Minerals & Metals Inv v. Hindustand Copper39 held that there is nothing in the Arbitration Act, explicitly or implicitly, which prevents any party from opting for a two-tier arbitration (i.e., one where there is an appeal from one arbitral tribunal to another, as chosen by parties in their agreement). The Court went on to clarify that the two-tier arbitration clause in the agreement did not violate the fundamental or public policy of India. The Supreme Court of India in Ashapura Mine Chem Ltd. v. Gujrat Mineral Development Corporation40 upheld and strengthened the application of the doctrine of separability in India. The Court had before it an appeal from a Section 11 petition that was filed seeking appointment of an arbitrator to settle disputes that had arisen out of a memorandum of understanding (MOU) to enter into a joint venture. Due to differences between the parties the joint venture was never entered into and the MOU never fructified. The issue before the court was whether parties had entered into a concluded contract and if not would the arbitration clause therein survive/bind parties. The Supreme Court not only upheld the separability doctrine but also held that dispute between parties centred on the relationship created by way of the MOU and whether it fructified into a joint venture agreement parties had agreed to refer all disputes to arbitration. The arbitration clause in the MOU was a separate agreement and was valid and enforceable. In Pricol Limited v. Jonson Controls Ltd. & Ors,41 the Supreme Court was faced with a vague arbitration clause that provided for sole arbitration. The clause further stipulated that in the absence of an agreement to the choice of the sole arbitrator, the parties would approach the Singapore Chamber of Commerce (SCC) for the appointment of the arbitrator. Unfortunately, the SCC was not an arbitral body, and did not have rules or infrastructure for the appointment of an arbitrator in such a situation. The Court upheld the validity of the clause, holding that a meaningful and reasonable construction of the arbitration clause must be given. Given that the SCC was not an arbitration institution, it was clear that the parties had actually intended a reference to the SIAC. any dispute arising out of the agreement or concerning the rights and duties or liabilities of parties were to be settled by arbitration pursuant to the ICC Rules of Arbitration. The clause notably was silent as to the seat of arbitration. The parties invoked arbitration, and in accordance with Article 14 (1) of the ICC Rules, after consulting both parties the ICC determined that the seat of arbitration would be London. The arbitration thereafter progressed, both parties participated, and there were two partial awards and one final award passed by the Tribunal. E-City Entertainment filed a Section 34 petition, seeking to set aside the awards before the Bombay High Court on the basis that Part 1 of the Act was not specifically excluded. The Bombay High Court ruled in favour of E-City Entertainment,43 and Imax Corporation approached the Supreme Court of India on appeal. that it is the place of arbitration that would determine the law that would apply to the arbitration and related matters like challenges to the award. In Armada v. Ashapura Mine Chem Ltd, the Bombay High Court had before it two arbitration petitions filed under Part 2 of the Act seeking recognition of two New York Convention arbitration awards arising out of two London Maritime Arbitrators Association arbitrations with their seat in London. Ashapura, the respondent, was a public listed Indian company that had filed a scheme before the Board for Industrial and Financial Reconstruction (BIFR) pursuant to the Sick Industries Companies Act (SICA). Section 22 of SICA provides temporary relief while a company is before the BIFR and is seeking to be rehabilitated by imposing, inter alia, a bar to proceeding for execution, distress or the like against any of the properties of a sick industrial company in India without the BIFR's permission. Ashapura opposed the Bombay High Court hearing the petitions on the basis of Section 22 of SICA. The Bombay High Court, however, took a took a pragmatic approach, holding that recognising the awards under Part 2 of the Act was not barred by Section 22 of SICA, and that only the actual enforcement of the award in India would be subject to the BIFR's purview. This harmonious interpretation of the provisions of the Act and SICA by the Bombay High Court is a pragmatic step that saved valuable procedural time for the award holder who would have, absent such an interpretation, had to wait for the BIFR to rehabilitate the sick industrial company before having the awards recognised under Part 2 of the Act. Prior to the 2015 amendments, the Act provided that the execution of any arbitration award was stayed upon either party filing a Section 34 application seeking to have the award set aside. By virtue of the 2015 amendments, Section 36 of the Act was amended to specifically require a party seeking to challenge an award under Section 34 and have it set aside to also take out a separate application for stay of execution, if such stay was desired. In Enercon Gmbh & Ors v. Yogesh Mehra & Ors,44 the Bombay High Court had before it a case wherein the arbitration was commenced before the 2015 amendments to the Act, but the awards were rendered after such amendments. The Court considered Section 2645 of the Arbitration & Conciliation (Amendment) Act, 2015, and held that since the challenge petitions under Section 34 were all filed after the amendments, the new provisions of the Act requiring a separate stay application would be applicable. Historically, several public sector undertakings (PSUs) in India provided for an arbitration clause that provides that all disputes would be referred to an arbitration to heard by the person holding a certain post in the PSU (e.g., a general manager). Such clauses have been upheld in the past to be valid by Indian courts. However, the position of the law changed with the recent amendments to the Act. In Assignia-Vil JV v. Rail Vikas Nigam Ltd, the Delhi High Court was faced with a situation wherein the parties had entered into a long-term construction contract and had referred certain disputes to arbitration. This arbitration was before arbitrators who comprised retired and serving employees of the respondent. During the pendency of this arbitration and the performance of the contract, certain further disputes arose. Furthermore, and during this intervening period, the new amendments to the Act became effective. Assignia-Vil JV therefore approached the Delhi High Court seeking appointment of an independent panel of arbitrators (i.e., arbitrators that did not comprise serving and ex-employees). The respondent contended that the issues with respect to the new dispute should be referred to the first tribunal, which was already constituted and hearing the previous arbitration. The Delhi High Court took a pragmatic view, however, holding that these were fresh disputes and that the arbitration had been invoked after the new legislation had come into force. The Court therefore held in favour of a fresh tribunal being constituted. In Aircon Beibars FZE v. Heligo Charters Pvt Ltd,46 the Bombay High Court confirmed that the parties could move for interim reliefs under Section 9 even if they have chosen foreign seat of arbitration and foreign law. The High Court had deliberated on the issue whether by virtue of choosing foreign law as governing law the parties excluded the application on Part 1 of the Act as provided in proviso to Section 2(2). The Court had rejected the submission that choice of foreign law as substantive law of the contract would restrict the applicability of Section 9 of the Arbitration and Conciliation Act, 1996 as that would be tantamount to exclusion of Part 1. The Supreme Court of India in M/s Centrotrade Minerals and Metal Inc v. Hindustan Copper Ltd,47 has held that two-tier arbitration clauses are valid and not against the public policy of India. The Supreme Court held that the Arbitration and Conciliation Act, 1996 does not prevent the parties agreeing on a procedure for arbitrating the dispute between them and they may agree to a procedure whereby the arbitral award might be reconsidered by another arbitrator or panel of arbitrators by way of an appeal. In Himangni Enterprises v. Kamaljeet Singh Ahluwalia,48 the Supreme Court after relying on the decision in Booz Allen & Hamilton In. v. SBI Home Finance Ltd49 held that a Section 8 application requesting the Court to refer parties in a civil suit (seeking eviction from the premises as tenancy matters) is non-maintainable as disputes pertaining to tenancy rights are non-arbitrable. In Alka Chandewar v. Shamshul Ishrar Khan,50 the Supreme Court has held that Section 27(5) of the Arbitration and Conciliation Act, 1996 empowers the Court to punish a party for contempt, non-compliance or disobedience, of any orders of the arbitral tribunal, and it cannot be restrictively interpreted to be applicable only in respect of orders passed for taking evidence. It was held that the entire object of providing that a party may approach an arbitral tribunal instead of the court for interim reliefs would be stultified if interim orders passed by such tribunal are toothless. In NTT Docomo Inc v. Tata Sons Limited,51 the Delhi High Court dismissed an intervention application filed by the Reserve Bank of India (RBI) since it was not a party as defined under Section 2(h) of the Arbitration and Conciliation Act, 1996 and therefore held that it cannot seek to intervene in the proceedings for enforcement of the Award. The RBI had intervened in the application stating that award was illegal and contrary to the public policy as it concluded that FEMA Regulations need not be looked into. The High Court held that the Arbitration and Conciliation Act does not recognise locus standi of an entity that is not a party to the award and accordingly dismissed RBI's application. The Supreme Court in TRF Limited v. Energo Engineering Private Limited52 has held that a person who is ineligible to be appointed as an arbitrator is not entitled to nominate an arbitrator. The judgment is in respect of unilateral arbitration clause. In the instant case, a managing director of the company was to be appointed as arbitrator as per the arbitration clause. The clause became invalid as a result of an amendment to Section 12(5) of the Arbitration and Conciliation Act, 1996. The Court applied the principle qui facit per alium facit per se (he who acts through another does the act himself) as such liberty, if granted, and held that, if an existing or future contract nominates a particular person to act as an arbitrator and also authorises such person in the alternative to nominate another, then the person loses both his or her right to act as an arbitrator and to nominate an arbitrator to preside over the arbitration in his or her place if he or she becomes ineligible due to the amended provisions of Section 12 of the Act. Being a signatory to over 80 bilateral investment treaties (BITs) over the past five years, India has found itself being enjoined as a host state party in approximately 10 or 12 investor–state arbitrations. Most of these disputes have arisen as a result of either the cancellation of a compulsory licence or the manner in which the revenue authorities have made an attempt to recover indirect and direct taxes from the Indian entity of an investor (e.g., cases brought against India by Vodafone, Nokia and Cairn Energy). Given this position, and given that India is currently in advanced negotiations with various party states, including both the European Union and the United States, it has carried out various amendments to its template model bilateral treaty, which we understand will now form the template for its future negotiations. the definition of the term 'investment' now incorporates the test in Salini Costruttori Spa and Italstrade Spa v. Kingdom of Morroco, making the definition dependent on whether it makes a concrete impact on or bears a risk to the economic development of the host state. Notably, there is no explicit definition of a fair and equitable standard of treatment, which is the most common yardstick applied when a party seeks protection under a BIT. The model treaty does, however, provide for a protective regime prohibiting the host state from committing violations of customary international law that amount to a denial of justice, a fundamental breach of due process, targeted discrimination or manifestly abusive treatment. Furthermore, the model treaty provides for a national treatment standard, whereby a foreign investor must be treated on a par with a domestic investor of the host state. Given the robust manner in which the standard has been set for the protection of fundamental rights and rights of an Indian citizen, this does set a rather high standard of protection in the Indian context. The new amendments have brought about a spate of new issues, and while they are well intended and have a tremendous amount of promise to make arbitration in India more robust, cheap and efficient, a lot depends on how the courts in India interpret and apply the legislation that has been recently introduced. If the past two to three years are a compass as to how the courts will interpret and give effect to these amendments, there is real reason for hope given the growing trend of Indian courts to respect the autonomy of arbitral tribunals by refusing to interfere in their functioning, and the growing trend to recognise and enforce both domestic as well as New York Convention awards. 1 Shardul Thacker is a partner at Mulla & Mulla & Craigie Blunt & Caroe. 2 Arbitration and Conciliation (Amendment) Act, 2015 (Act 3 of 2016) with retrospective effect from 23 October 2015). 3 Bhatia International v. Bulk Trading SA (2002) 4 SCC 105. 4 Section 2(f) of the Arbitration and Conciliation Act, 1996. 5 Section 7 of the Arbitration and Conciliation Act, 1996. 6 Reva Electric Car Company Private Limited v. Green Mobil AIR 2012 SC 739. 7 Ashok Traders v. Gurumukh Das Saluja (2004) 3 SCC 155. Section 16(1). 8 Section 5 of the Arbitration and Conciliation Act, 1996. 9 Section 11 of the Arbitration and Conciliation Act, 1996. 10 Section 9 of the Arbitration and Conciliation Act, 1996. 11 Section 27 of the Arbitration and Conciliation Act, 1996. 12 Section 34 of the Arbitration and Conciliation Act, 1996. 13 Section 37 of the Arbitration and Conciliation Act, 1996. 14 Section 2(1)(e) of the Arbitration and Conciliation Act, 1996.
independence, under the Letters Patent granted by Queen Victoria in 1862) – are the only high courts in India that enjoy original jurisdiction. 16 Section 42 of the Arbitration and Conciliation Act, 1996. 17 Section 12 of the Arbitration and Conciliation Act, 1996. 18 Seventh Schedule, Arbitration and Conciliation Act, 1996 (Act No. 26 of 1996). 19 Section 13 of the Arbitration and Conciliation Act, 1996. 20 Section 29-A of the Arbitration and Conciliation Act, 1996. 21 Section 29 –B of the Arbitration and Conciliation Act, 1996. 22 Section 26 of the Arbitration and Conciliation Act, 1996. 23 Section 27 of the Arbitration and Conciliation Act, 1996. 24 Section 17 of the Arbitration and Conciliation Act, 1996. 25 Section 9 of the Arbitration and Conciliation Act, 1996. 26 Ashok Traders (see footnote 7). 27 Section 9 (2) of the Arbitration and Conciliation Act, 1996. 28 Section 9 (3) of the Arbitration and Conciliation Act, 1996. 29 ONGC v. Saw Pipes Ltd (2003) 5 SCC 705. 30 Section 36 of the Arbitration and Conciliation Act, 1996. 31 Section 48(1) of the Arbitration and Conciliation Act, 1996. 33 Section 47 of the Arbitration and Conciliation Act, 1996. 35 (2016) 8 SCC 788.
f eviction or tenancy matters governed by special statutes where the tenant enjoys statutory protection against eviction and only the specified courts are conferred jurisdiction to grant eviction or decide the disputes. 38 A Ayyaswamy v. A Paravisam (2016) 10 SCC 386. 39 Centrotrade Minerals & Metals Inv v. Hindustand Copper AIR 2017 SC 185. 40 Ashapura Mine Chem Ltd v. Gujrat Mineral Development Corporation 2015 (5) SCALE 379. 41 Pricol Limited v. Jonson Controls Ltd & Ors (2015) 4 SCC 177. 42 Imax Corporation v. M/s E- City Entertainment (I) Pvt Limited AIR 2017 SC 1372. 43 2013 (6) BCR 654 (Reversed). 44 Enercon Gmbh & Ors v. Yogesh Mehra & Ors MANU/MH/0400/2017 (judgment dated 3 March 2017 in Chamber Summons (L) No. 7 of 2017). 46 Comm Arbitration Petition (L) No. 208 of 2017 (Bombay High Court). 47 (2017) 2 SCC 228. 48 Civil Appeal No. 16850 of 2017 (Supreme Court). 49 (2011) 5 SCC 532. 50 Civil Appeal No. 8720 of 2017 (Supreme Court). 51 O.M.P.(EFA)(Comm.) 7/2016 and IA's 14897/2016 and 2585/2017 (Delhi High Court). 52 Civil Appeal Nos. 5306 of 2017 (Supreme Court).